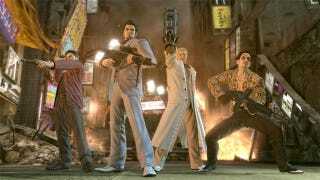 Last week, the latest entry in Sega's popular Yakuza series hit Japan after suffering a brief delay. It was the country's bestselling game by a huge margin, killing the other new zombie-filled game on the market. But there was some not so good news for Sega's newest gangster game. Yakuza: Of the End crushed the competition, selling nearly 300,000 copies in its first week on the market in Japan. Damn good, but not as impressive as the last two entries on the PlayStation 3. Yakuza 3 managed to move 372,000 copies in its first week on sale two years ago. Yakuza 4 outperformed that with a debut tally of 384,000 copies last year. Yes, Yakuza 3 Is Japan&apos;s Bestselling Game... But What About Halo Wars? Yakuza: Of the End did less business with a larger PS3 install base, either telling us that Japanese gamers are experiencing annual Yakuza fatigue or they just don't like the introduction of undead in their gangster brawler-dramas. Whatever Yakuza's fate, here are the top 20 bestselling games in Japan, courtesy of Media Create. It includes two Evangelion games and one Red Faction game, which managed to break its way into the top ten. On the hardware side of Japan's video game market, the PSP continues to enjoy its first place prominence, a perch that looks more than ever to be threatened by the Nintendo 3DS. Sales of Resident Evil: The Mercenaries 3D are probably helping. We'll see what effect the re-release of The Legend of Zelda: Ocarina of Time does for the 3DS next week.